I saw this piece of packaging at my local supermarket and thought it was a really good example of a company taking advantage of new packaging technologies to creative with the way that their product is being packaged – and as a result it really stands out form their competitors on the shelf. 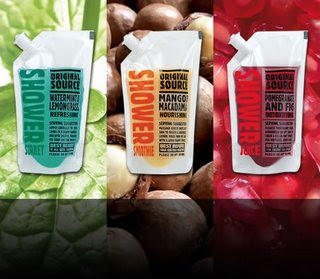 The packaging has been designed to look like the packaging of a soft drink which ties in with the name – shower smoothie – and communicates the idea that this product is designed to refresh your skin. Even the copy is clever with a serving suggestion and best before that reads ‘best before: your skin feels neglected’. Not sure about this one Dan . . . at first gance I thought it was some kind of medical bag that you'd be attached to in hospital. Not a good thought to have whilst showering! Scarlet... Anthony... you've just ruined it for me! Now I feel unclean everytime I use it in the shower. I've added another photo thinking that that would help but I've just made it worse - the red 'Pomigranit and Fig' one really does look like blood and the yellow 'Mango' one like a catheter bag (eeew). Ok, maby I got this one wrong - I still think they had a good idea though (they just got lost somewhere along the line). I specifically bought this original source shower gel because of the packaging. And I like it! Its nice to have a change from the conventional bottle of showergel. I mean if we never tried to create new things then nothing would ever change. I also commend Original source on the nice use of type on the packaging, very sophisticated!